20-year Reunion: July 1995 at the Stone Crab Inn and Westover VFW (pictures and details to be uploaded...someday) Click here to see a few miscellaneous pictures--thanks (as always) to Doug Bowers. 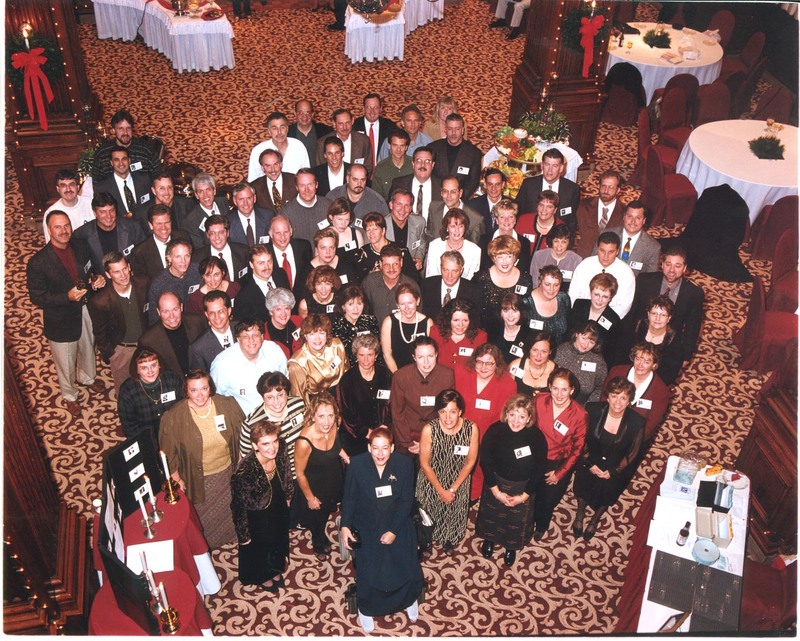 25-year Reunion: November 24 and 25, 2000 at LaCasa and the Clarion Hotel Morgan. See if you can put a name to the faces. If you get stuck and are really curious, e-mail us and we'll try to help you out. Check out our weekend pictorial review (more pictures to come someday...of course, it's only taken us a year to get these on in our oodles of spare time, so be sure to take your computer to the rest home with you to see future ones). And see the group photo below (admittedly missing a few, but you may find them in our Friday or Saturday evening pictorials). Note: Large file size (399121 bytes) may take slow computers a while to open. ©Spellmen Studio 245 McClellandtown Rd., Uniontown, PA 15401, MM. Thanks to all for their donations (with apologies to anyone accidentally overlooked--send me an email if you're one of them). See who signed up to attend...but others showed up too, particularly at the casual Friday event, so this list is admittedly not accurate. 30-year Reunion: November 25 and 26, at LaCasa and Clarion Hotel Morgantown. This page was last updated: February 06, 2010.